Knotted Open Work was a requested stitch, and when I was looking through my stitch books to see if it was known by another name, I found Open Star Stitch. They are almost identical, except that Open Star Stitch is more knotty and textured. Here is a video with both stitches. Enjoy! Thank you for the video tutorial! 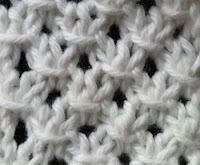 Found you through a Google search for the open star stitch...just what I was looking for! 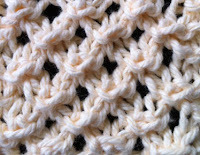 Have you ever made a hat using the knotted openwork stitch?